You may have mastered the art of creating gum paste or fondant leaves with punches, cutters, and veining mats and you are ready to move onto chocolate leaves to adorn your cakes and cupcakes. Chocolate modeling paste is an option for these intricate looking decorations, but real chocolate that has been tempered and formed is also a treat to work with for your designs. There are several methods for creating leaves and you can pick the perfect one when considering how the leaves need to look for your cake. 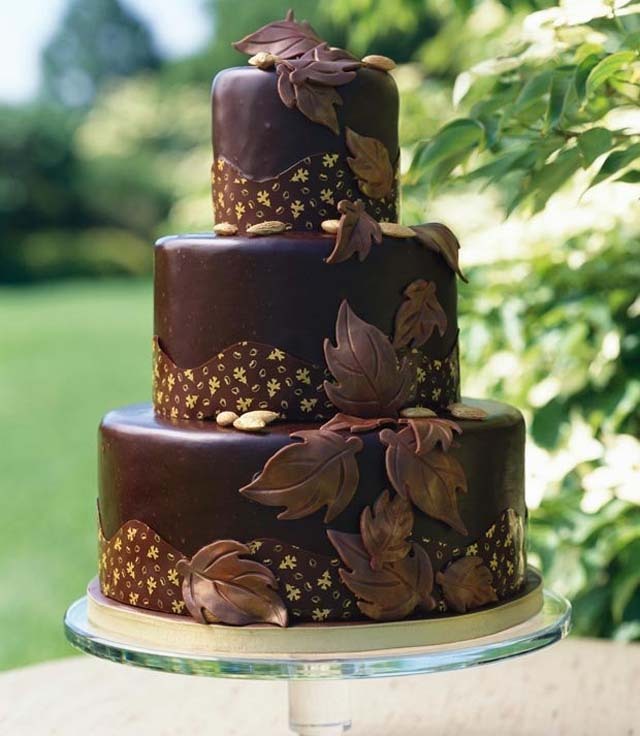 Leaves can be retro in appearance, almost cartoon like, or realistic depending on the cake design and your skill level. Modeling chocolate can be rolled out and cut into leaf shapes easily, veined with a few deft strokes of a knife or veining tool and left to dry. For interesting looking leaves, drape the chocolate leaf over something or dry the modeling chocolate in a cup or bowl to get pretty curling edges. These leaves can be dusted with gold, tipped in silver, or accented with other colors in luster dust after they have dried. When your leaves are washed and completely dry, you need to lay them out on a parchment covered baking sheet, facedown so that the veiny backside is facing up. The trickiest part of making chocolate leaves for some people is tempering the chocolate. You can certainly use untempered chocolate or purchase chocolate that has been previously tempered, but the lovely shiny finish will be missing. Tempering chocolate is not as difficult as you might think, just follow the guidelines and everything should work out beautifully. Once your chocolate is tempered, leaves are laid out and dry, you are ready to make chocolate leaves. Simply brush a thin layer of chocolate on the backs of your leaves, a little thicker around the stem area so that it remains intact when you peel the leaf away. If you have a steady hand, pick the leaf up during this technique, taking care not to get chocolate around the front of the leaf. You can also brush the chocolate on the leaf as it is lying on the parchment and simply move it afterwards to keep the edges sharp.Let all the leaves dry completely and repeat this process until each leaf has three layers of chocolate on it, moving the leaves in-between each time so there is no excess chocolate around the edges. Let the leaves dry completely for about 5 hours and then peel the real leaf away from the chocolate one. You will be left with a lovely chocolate leaf, veins and all. You might notice that the backside of the leaf is not as pretty, although as your technique improves, the bumpiness will be less. Store your leaves in single layers in the fridge in sealed containers until you wish to use them. Take care not to handle the leaves too much while decorating your cake because your body heat is enough to melt the leaves. You can use any type of chocolate for this design element.